Several years ago, I bought an awesome vintage suit on eBay. I recently decided it would be the perfect outfit to wear to my cousin's upcoming wedding. Of course, I want my look to be as perfect as possible, so I started doing some research. What sort of shoes would have been worn with a suit like mine? What sort of hat? Would I need a full on, Mad Men style bullet bra to really rock the look? To answer these questions, I turned to my old friend, The Internet. What began as a simple research project turned into a journey through history. 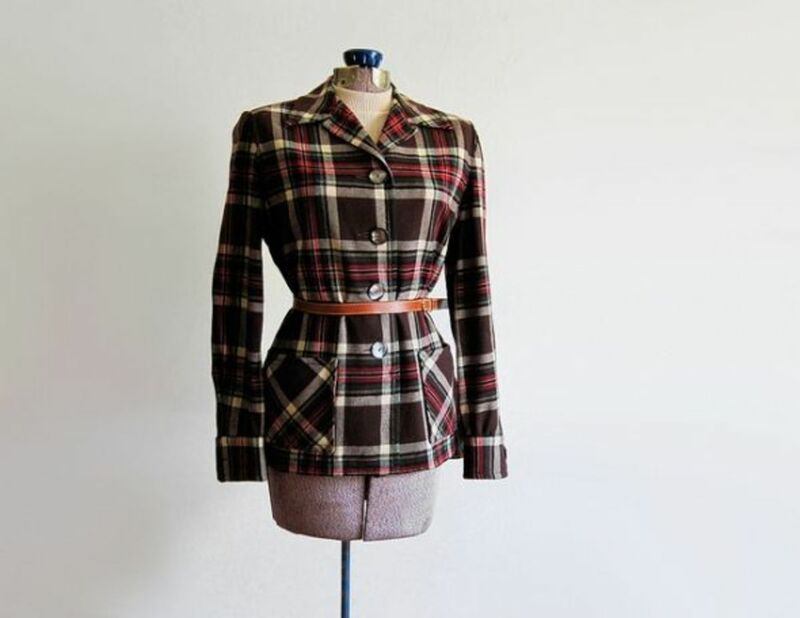 After looking at several images of vintage womens suits, and doing a lot of reading, I decided that my suit most resembled pictures and sewing patterns from the early 1940s. The more I read about 1940s fashion, the more interested I became in its fascinating backstory. 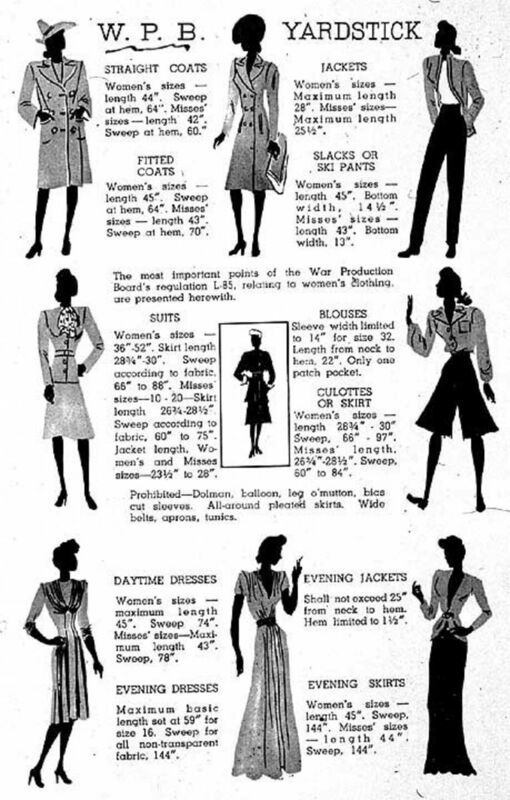 Just as with all fashion, the clothing of the 1940s was shaped by its times. I knew it had been influenced by the cut and color of military uniforms, which were ubiquitous due to the war raging in Europe. I also knew that women who were replacing men in the factories had started wearing pants, and found them to be comfortable and practical. What I hadn't known was how much 1940s fashion was shaped by the acute pressures of wartime rationing. The fabrics used and the styles employed are a direct result of restrictions on materials put in place to help the war effort. 1940s fashion can even be added to the (long) list of things that have led to race riots in Los Angeles. Below is some of what I learned about clothes rationing in Britain and the United States during the war. I've included plenty of great pictures, some wartime film clips from the Home Front, and to add to the ambiance, a few WWII era songs. Enjoy! 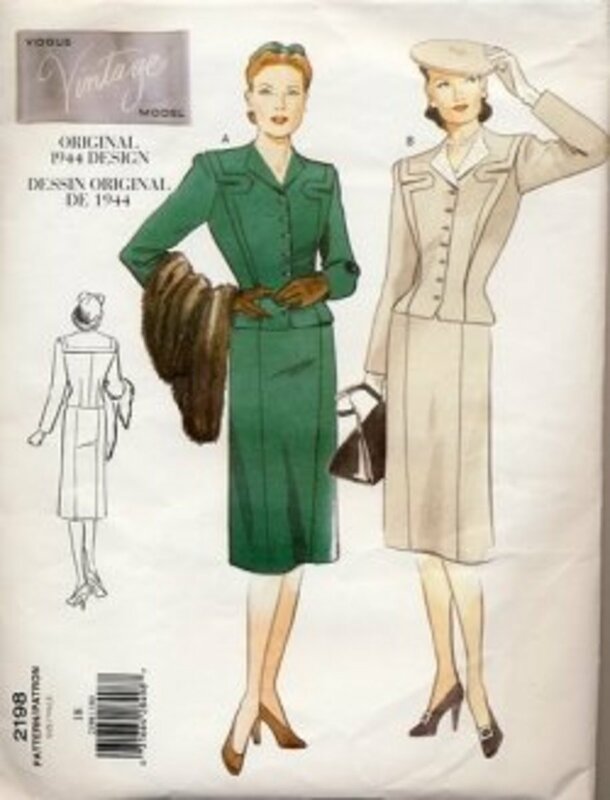 When I think of the fashion of the 1940s, I think of sleek lines and square shoulders. The sleeves are fitted instead of puffed or draping. The simple simple A-line skirts fall just below the knee, or the skirt is forgone in favor of slacks. I imagine good, solid shoes with a square heel or a wedge. I'd always imagined this to be the influence stars like Kate Hepburn and Rosalind Russel, and to be sure, they played a part. What I didn't realize is that 1940s fashion was highly economical. The sleek lines saved precious material. The solid shoes were practical for women going to work for the war effort. Even certain combinations of color and fabric, which look odd --even outlandish -- to my modern eyes, can be explained by creative women who lived by the slogan "Make Do and Mend". The last successful invasion of England was achieved by William the Conqueror in 1066, but that doesn't mean that Great Britain is invulnerable. It is an island nation with a large, dense population, and not a lot in the way of forest plantations or mineral wealth. The resulting economic pressures led Britain to seek raw materials through colonial expansion. In 1939, the defense industry and the consumer economy both relied on goods shipped from overseas, either from Britain's colonies or from other countries. Germany had spent the interwar period developing viable and deadly submarine technology. With the outbreak of war, Germany began to attack Atlantic shipping lanes, disrupting the imports Britain relied upon. U-Boats and other ships were deployed against supply convoys from North America and the South Atlantic, with the goal of denying Britain the supplies it needed to continue fighting -- or even to prevent famine. Merchant convoys were protected by the British and Canadian naval and air forces, and, after 1941, by American forces as well. The German blockade was never a complete success, but supplies remained scarce. Rationing was required to ensure that everyone in the population got enough food, and also to ensure that enough textiles, leather, rubber, and other raw materials were available for the war effort. 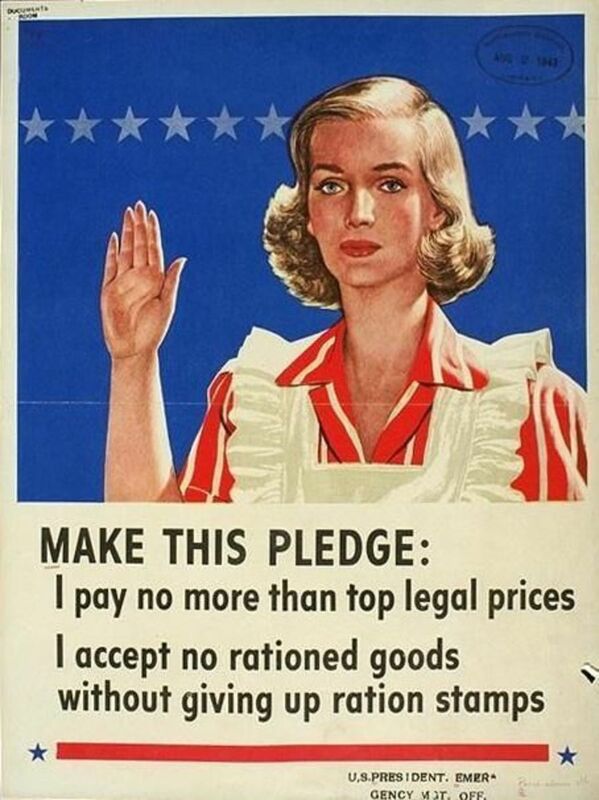 Food rationing was introduced in early 1940. In 1941, austerity measures were enacted to conserve textiles. To prevent a run on stores, clothing rations were announced abruptly -- literally overnight. The population awoke in June of 1941 to see announcements of shop closures in newspapers and women's magazines. 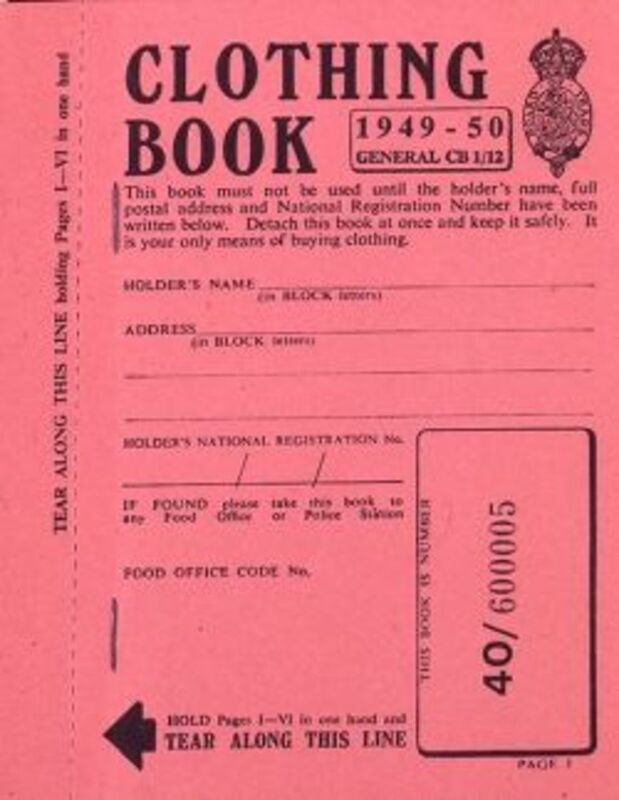 When the shops reopened, ration coupons would be needed to make any purchase of clothing. These measures were undertaken not to deprive anyone of what they needed, but to make sure that each person got their fair share of the country's goods. At first, each person received 66 coupons per year -- enough for one new outfit of clothes. That number would go down to 48 coupons the following year, to a low of 36 coupons in 1945. 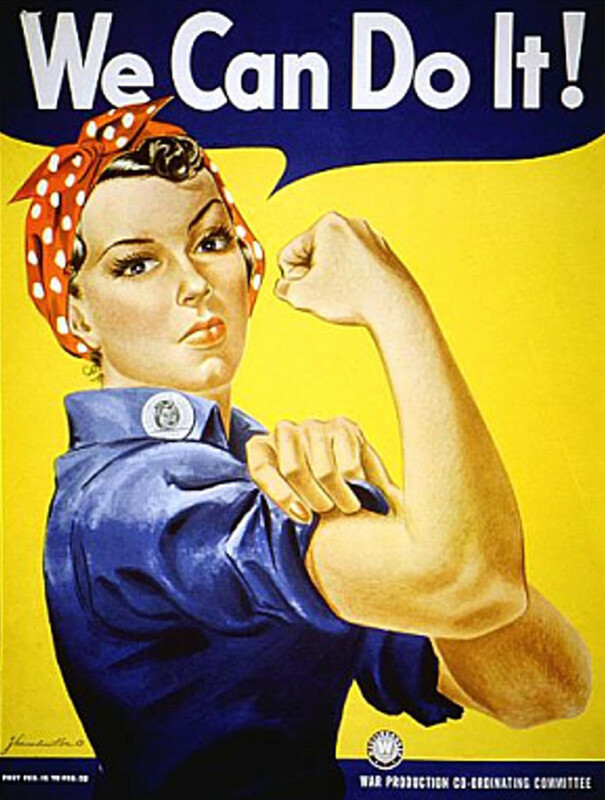 Women were encouraged to "Make Do and Mend". They used their creativity to repair and extend the usefulness of the outfits they already had, they remade old outfits into new ones, and they turned drapes and bedding into clothing. With nylon and silk needed to make parachutes, many painted their bare legs to simulate stockings. With rubber and leather needed desperately by the war effort, they turned to shoes with soles made of cork, which was not subject to rationing. "Make Do and Mend" was a common slogan in wartime Britain. This short film by the ministry of supply demonstrates how old items can be be made into new -- a baby's cot from old sacking, dressing gowns from patchwork, and ladies' dresses from men's dress clothes -- and includes a short "fashion show" with examples. The laws of economics don't apply! Don't you know, there's a war on? There's a saying about economics: you can control price of a good, or you can control the quantity of a good -- but you can't control both. Nonetheless, the Civilian Clothing Act of 1941 managed to simultaneously control the price of scarce goods while controlling the supply of valuable war materiel. The CC41 Utility Scheme limited extraneous uses of fabric, such as cuffs and pockets; and both manufacturers and retailers faced restrictions on their profits from making and selling their goods. 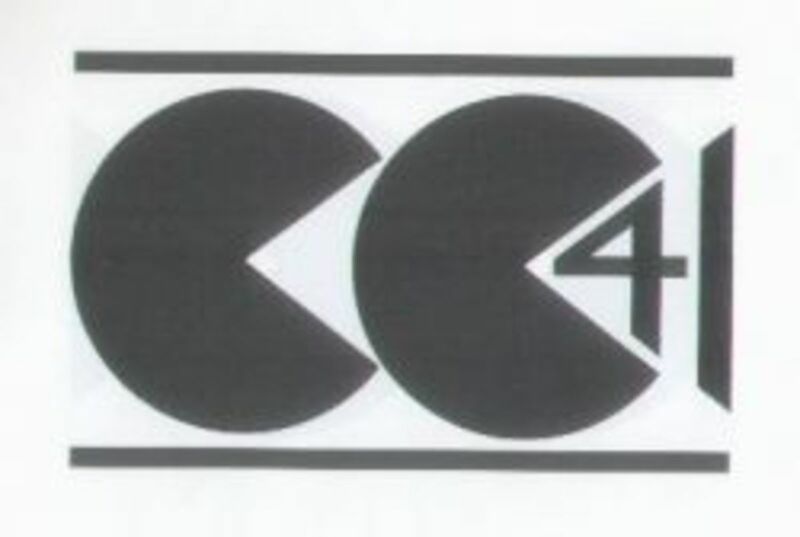 The CC41 logo came to be known colloquially as "the cheeses". At first there was resistance to the Utility Scheme, but in time, clothing carrying the CC41 logo was found to be durable, cost effective, and offering a fair degree of consumer choice. In 1942, the government issued the Civilian Clothing Order, adding force to the Utility styles. By this time, superfluous trim, embroidery, buttons, or pockets had come to be considered bad taste and even unpatriotic. 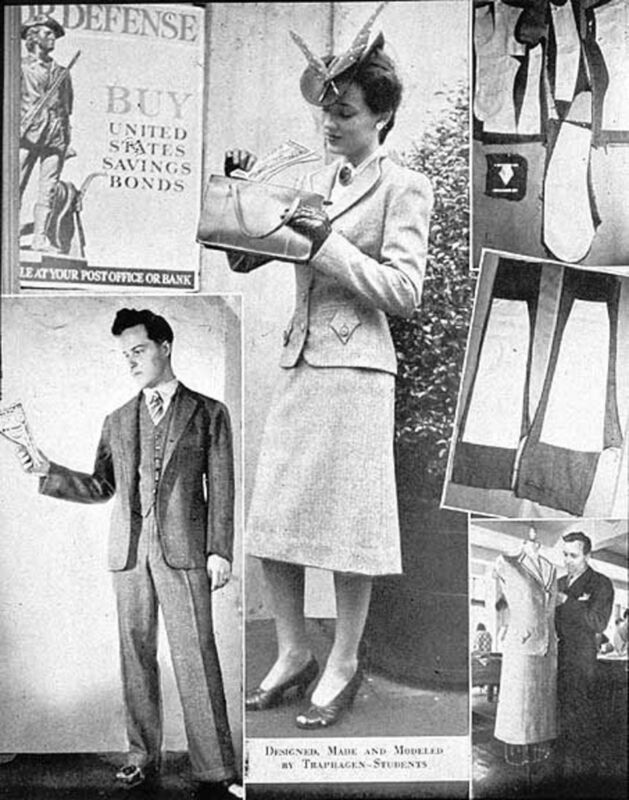 Suit, Utility Scheme, 1942. Museum no. T.43-1942. Victoria and Albert Museum. 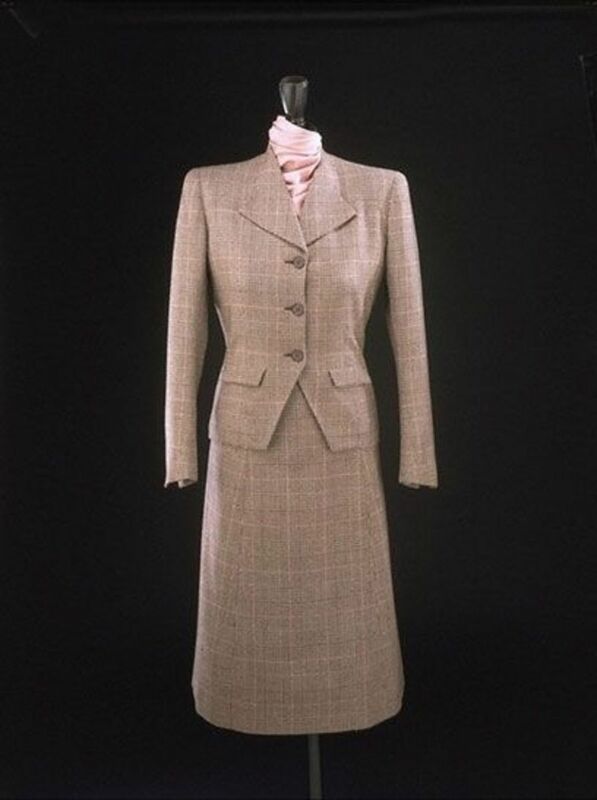 This Utility Suit, from the Victoria and Albert museum's online image collection, was designed by Edward Molyneaux in 1942. Molyneaux was a member of the Incorporated Society of Fashion Designers, which created a line of 34 designs that would be affordable, hard-wearing, and conform to austerity laws. There is nothing extraneous in the suit pictured. There are no pleats, vents, ruffles, or cuffs. The bottom of the jacket is cut away at an angle to conserve fabric. Even the pockets are likely to be simple decorative flaps -- pockets were restricted to avoid wasting fabric. Even in the States there are usually a few items with the CC41 logo to be found on eBay. 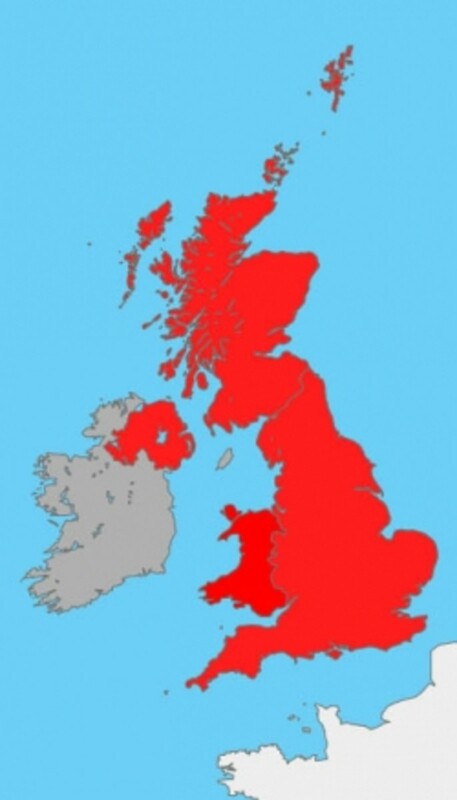 If you're in the UK, your luck is bound to be better. Had you heard about the CC41 Utility Scheme before this? - Please share your answer! The CC41 Utility Scheme was one of the more interesting pieces of information I turned up while researching my suit. I'd never heard of it before. Had you? If you had, where did you learn about it? And just for my own curiosity, what country are you from? Have you heard of the CC41 Utility Scheme? 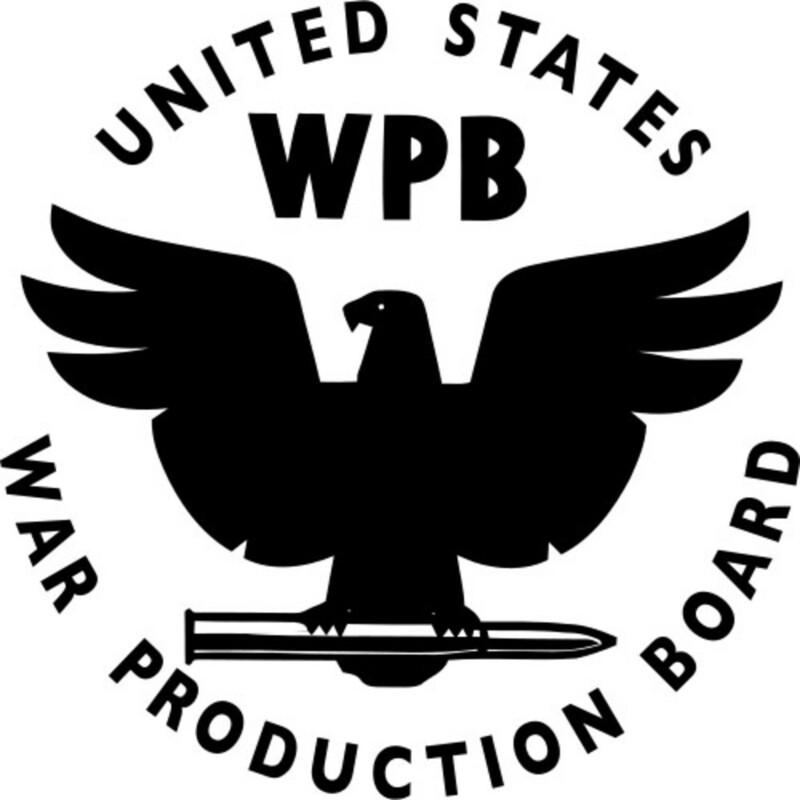 When the United States entered World War II in late 1941, the War Production Board was created to convert civilian industry to war production. It also ensured that necessary resources, such as textiles, were diverted to the war effort. Wool, needed for military uniforms, as well as silk and nylon, needed to make parachutes, became rare in civilian life. The Office of Price Administration was created to oversee rationing of certain foods, metal, gasoline, and shoes. Leather and rubber were needed for the war effort, so American consumers were restricted to buying three pairs of shoes per year. Americans on the Home Front faced a situation much less dire than their British counterparts. The United States was rich in natural resources, and was not relying on imports of raw materials for war production. As a result, the OPA and the WBP were able to take a more lenient approach to rationing in the States. WBP Regulation L-85 - The Government Is Controlling Our Hemlines! Instead of limiting the number of outfits each person could purchase, the War Production Board required clothing manufacturers to adhere to certain fabric-saving guidelines when making clothing. Skirts, jackets, and slacks could not exceed a certain length, and the amount of fabric used in hems was kept to a minimum. 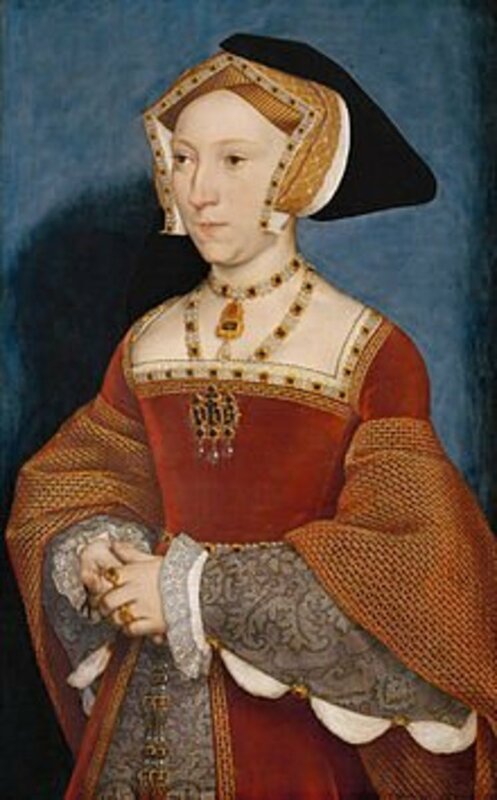 Certain fabric-intensive styles of sleeves were prohibited altogether. Garment-makers who violated these restrictions were subject to fines or even imprisonment. Consumers faced no rationing or restriction on what items of clothing they could buy. My grandmother, who was in her mid to late teens during the war, says that she never had any difficulty getting what she wanted at the dressmaker's shop. Additionally, the WPB restrictions did not apply to garments sewn at home for personal use. Natural fibers were diverted to the war effort, but many synthetic fabrics, like polyester and rayon, were available. The cost of goods in wartime was nonetheless quite high, so the government issued publications to advise the public on how to get the most out of their clothing and textile purchases. The Menswear Influence - This suit bought a war bond! As in Great Britain, the government of the United States could rely on social norms to do much of their conservation work. Reusing and restyling old garments into new ones came to be seen as an act of patriotism. That "Menswear Look" in 1940s fashion exists for a very good reason: men in uniform didn't need their suits anymore, and suiting fabric was expensive and difficult to find, so many designers and creative seamstresses simply remade men's suits into outfits for women. In the 1940s, Veronica Lake was famous for her long, flowing hairstyle, which seductively fell across one side of her face. With women entering the workforce in large numbers, such a hairstyle was no longer practical for many women. In this wartime video, Lake demonstrates hair styles that are safe for the factory floor. Shoes were rationed starting in 1943 in order to conserve leather and rubber. Espadrilles, a style of shoe with an upper made of fabric and a sole made of jute, became very popular because they were not subject to rationing. Wedge heels, made of wood, were also popular. 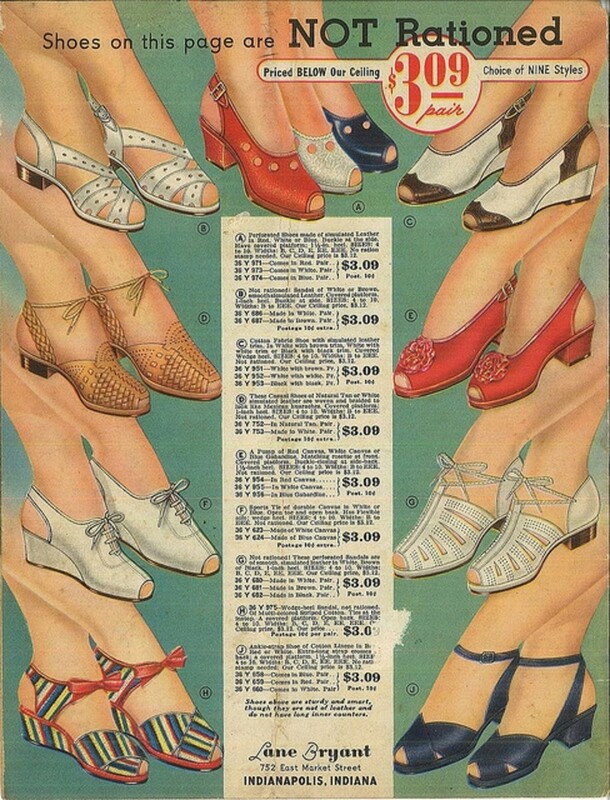 Shoes in "victory colors", such as the ones available in red, white, and blue at the top center of the above image, made a statement that was both stylish and patriotic. Make This Pledge! - C'mon ... you can't say "no" to Rosemary Clooney! This poster informs consumers that shopkeepers who did not collect their ration coupons were probably selling black-market goods. Not everyone was on board with the ration system -- at least, not everyone, and not all the time. In Britain and in the United States, people got around the ration scheme by trading coupons or resorting to the black market. Many people saw nothing wrong with paying under the table for a special item for a "special occasion". While this was technically illegal, prosecution for selling or purchasing black market consumer goods was rare. This led to organized crime taking an interest in the black market. The petroleum market was particularly lucrative, and organized crime groups began to make counterfeit coupons which they sold to gas station owners and to drivers. At one time, the OPA estimated that 5% of all gasoline sales in the country was being purchased with fake coupons. This WWII film outlines the moral and practical dangers of buying meat on the black market. So you think the Black Market is all fun and games, do you? Do you want to be like Mrs Wilson, a Parasite, Preying on the Body of a Community at War? Most Americans, even those who dabbled in the black market from time to time, saw themselves as patriotic, upstanding people. Even if they could afford enough fabric to sew extravagant outfits at home, free of any War Production Board garment restrictions, clothing with too many frills was considered wasteful. Worse than that, it was unpatriotic. Worse even than that -- it was in bad taste. The famous Zoot Suit flew in the face if wartime convention. The long jackets, full-cut trousers, and wide ties were popular in African American, Italian American, and Latino American communities. Throughout the 1930s, the zoot suit gained visibility when worn by Black jazz band leaders such as Cab Calloway. By the 1940s, zoot suits became an iconic form of dress among the Pachuco youth subculture. These youth, often the children of Mexican migrant workers, were neither culturally "Mexican" or culturally "American". Pushed to the margins of both cultures, Pachuco youth responded by flaunting their difference. They developed their own Spanish dialect, they formed gangs, and they continued to wear zoot suits. The Zoot Suit Riots - It all boils down to race. Tell me you're not surprised. In June of 1943, Los Angeles was the scene of riots directly related to the zoot suit. Due to War Production Board regulations, zoot suits were only available through bootleg tailors dealing in black market goods. Wearing one was to defy the laws of rationing, to challenge the status quo, and to snub mainstream White culture. Like other port cities in California, Los Angeles had become rapidly overcrowded with war laborers and service members. The police and press at the time characterized all Mexican American youth as petty criminals, and White sailors and Marines, who were offended by the very idea of zoot suits, were only too happy to have their stereotypes confirmed. When a group of sailors got into an argument with a group of young men in zoot suits on the night of June 3, 1943, the Zoot Suit riots were just waiting to happen. The group of sailors claimed that the zoot suiters had jumped them. The next day, 200 members of the US Navy got into 20 taxis and heading into East Los Angeles. Their first victims were a group of 12- and 13-year-old boys. The sailors beat the boys and any adults who tried to help them, and then stripped the boys of their suits. In the days that followed, thousands of service personnel, accompanied by police, took to the city and beat up any Latino males they encountered. The beatings escalated to include African American and Filipino men as well. On June 7, the Navy and Marine Corps confined all personnel to barracks, but the official position remained that the rioters were acting in self defense. Had you heard of the Zoot Suit Riots? - Share your answer with the rest of the class! 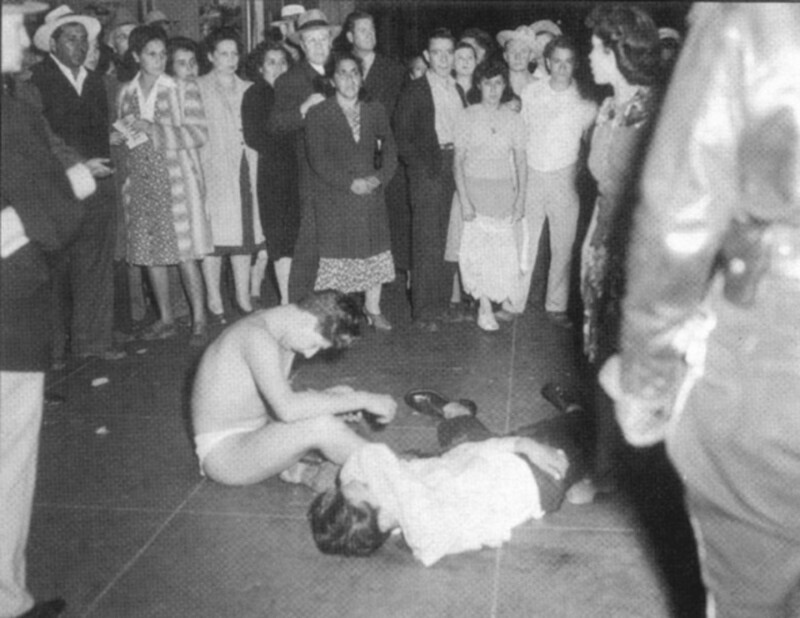 Before researching my vintage suit, I had no idea the Zoot Suit Riots were a real event. Had you heard of them before now? If yes, how did you learn about them? And if you don't mind telling us, what country and city are you from? Have you ever heard of the Zoot Suit Riots? In the United States, the War Production Board was replaced by the Civilian Production Administration in October of 1945. The Office of Price Administration was abolished, along with rationing, in June of 1947. The Zoot Suit Riots became a historical footnote. When Christian Dior (who had spend the war in Paris, designing for the Vichy regime and the occupying Nazis) debuted his "New Look" in 1947, Americans were ready for the long, full skirts and opulent designs he introduced. The "New Look" was simply not an option for most British consumers. The CC41 Utility Scheme was continued until 1952, with other forms of rationing continuing until until 1954 -- a full nine years after victory was declared in Europe. I could not have written this lens without the material contained on these sites. They're great resources if you want to learn more about rationing or 1940s fashion. 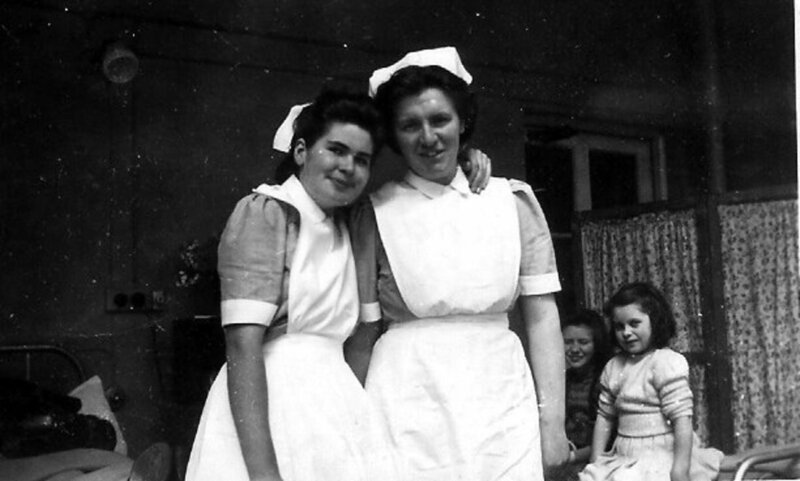 Pauline Weston writes about the rationing laws in the UK during WWII, and how the clothes-wearing public responded. An extremely thoughtful, nuanced, and thorough analysis of zoot suits, race, and the Zoot Suit Riots of 1943. An informative article about CC41 Utility Clothing in WWII Britain. More info about the Utility Scheme. Carol Nolan provides more information on American fashion of the 40s. This article from the Oregon State Archives discusses the black market resulting from wartime rationing. A discussion of the events leading up to the Zoot Suit Riots, and their aftermath. 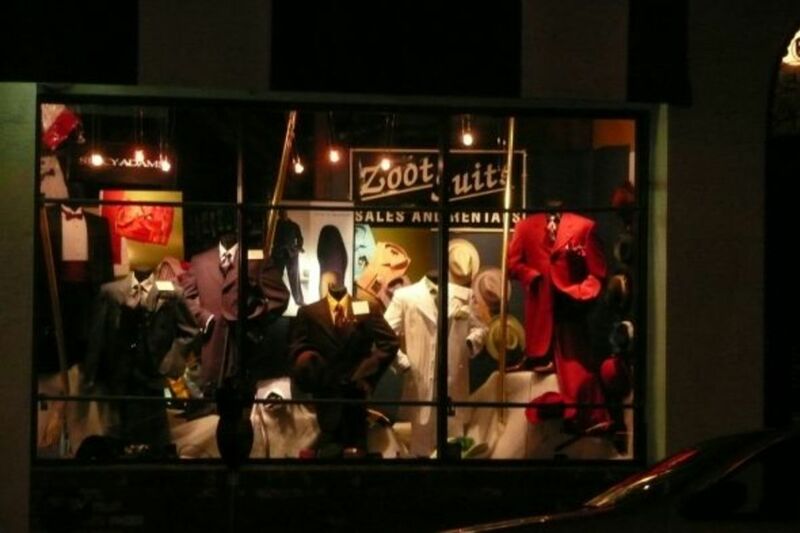 Defines and describes the Zoot Suit and its origins. Some CC41 items are still around. If you're interested in collecting them, check out this link. 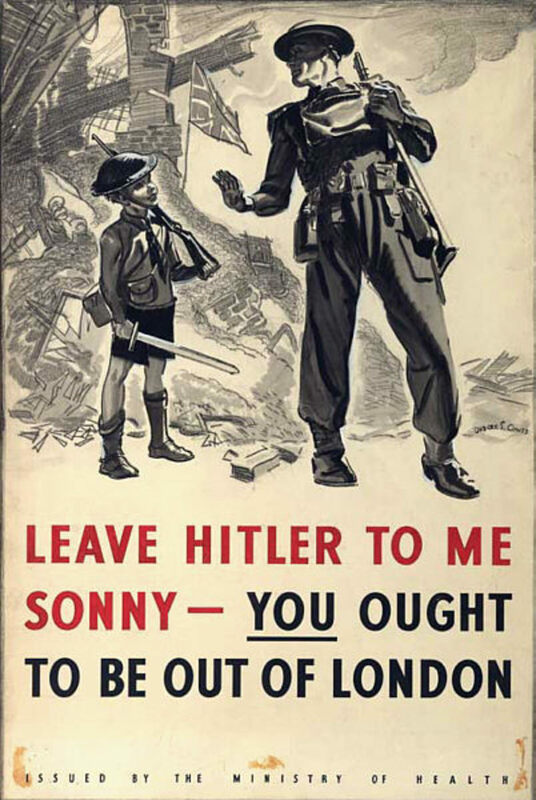 Do You Or A Family Member Have A Rationing Story From The War? - Share It Here! Thanks for share. I like your lens. I'm writing an episode of television set in the 1940s and clothing is one of its central themes. Very helpful compilation of facts, music, and images! Wow, not one to regularly read an article on women's fashions, this was fascinating! Great lens. My mother had to take her friends ration coupons to buy a suit for my 2 year old brother to be buried in. I like learning about the vintage clothing styles of the past because the have influenced modern fashion today. My grandmothers would have had some, I'm sure. Once again, an incredible piece of research. Thanks for taking the time to put this together. My family at the time, at least the side of the family I have these stories from, lived in a very small rural community during the war years so there wasn't really much to ration to begin with. The fashion choices of today's modern woman are as plentiful as the sands of the sea. Pants, shorts, dresses, vests, sweaters, jackets, leggings, and skirts are seen in every colour, length and fabric imaginable. No type of clothing or lack thereof is considered off limits. For centuries society has argued about women's clothing. Everything from the cut of a blouse, to the length of womens shorts has been debated. The evolution of fashion has helped women to ignore the opinions of society and wear whatever makes them feel comfortable in their own skin. I just couldn't overlook your outstanding lens! I definitely always enjoy reading it, whenever I come and can't help myself but bless it too! A great example from which some should take inspiration! Wow, what a job you did with the history. I love it. I am joining your fan club! I love the clothes from the 1940s and found your page fascinating, great pictures too. Blessed. My grandmother used to tell me about the coffee, or rather the barley they had to roast instead of coffee. Some people would even eat rats, only meat available. Very difficult times. @huvalbd: I've heard about the high casualty rate in the Merchant Marines. They were the first Americans to enter the war -- before it was formally declared, and long before D-Day. I think PBS did a special on it a few years ago, and it's well worth watching. Thanks to everyone who has shared a family story in the comments here. You really add a lot to this lens. This is hands down my favorite look for women. I love the classic 40's style. Great lens! My grandmother in Texas talked some about the rationing, which was more at the level of inconvenience than the misery that it was in Britain. But our family talked more about the convoys. My maternal grandfather was a tanker captain in the convoys taking supplies to Britain, and my father was in his crew. (That's how my mother met my father.) The US Merchant Marines had tremendous casualty rate reputedly higher than any branch of the military. But to keep Britain going, it had to be done. @KarenTBTEN: Sadly, I suspect that was the case for a lot of families in Europe and in the US. Some of my family was already so poor that I don't know how much it affected them. This is quite a nice bit of history. Blessed by a Squid Angel. @Richard-H: Thanks for the Angel Blessing. You're right that rationing lasted until 1954. I know a British woman who was a child during rationing, and she said it felt like they'd won the war but lost it at the same time. @justholidays: Dom -- I hadn't thought about it before, but of course the black market would be the only way for Jews in hiding to survive. What great stories your family has. Coming from the UK, my parents told me many stories of the days of rationing during the War Years. In fact, I believe all rationing was not done away with until the early 1950s, as the UK was still suffering from the effects of WWII. Of course we have! Belgium suffered during the war mostly because we're normally a neutral country and that we were attacked even while we had the same status as Switzerland. Rationing was normal here from 1940 till over 1945; my grandparents told me thousands of accounts about this but my some of my family members had a butcher shop and they used to feed the entire village where they lived from the very first day of the war till the last one and over. The stories my grandparents told me were amazing! Definitely enjoyed this page and will save it on my computer so that I can check it back later.